I first met Bob in the summer of 1997 some 20 years ago. He and Debbie were new parents with the arrival of their son John. Time has flown by quickly and now John has joined his father in the business. Bob built our cabin we call “Boomer”. It is my favorite of all the cabins he has built for us. A load of logs were delivered and dumped on the building site and within a few months we had our cabin built; it was built with extreme care and craftsmanship. It really has character and is truly a work of art. Following “Boomer” in 2007, Bob totally remodeled our cabin we call “Blue Skies”. In addition to the total remodel, we added onto “Blue Skies” cabin doubling the original size. Again in 2009 Bob built a new cabin we call “Snowflake”. All these cabins were built with the utmost care and concern for our needs. Bob, without question, has stood behind his work. As an absentee owner Bob has looked after the cabins and if anything needed to be done, he has always taken care of the problem Immediately. As an example, after 20 years, we had a bear break into one of the cabins. Fortunately it was discovered immediately and I called Bob. He was there within a hour securing the building. He had the window fixed and the doors repaired. I did’t have to worry about anything. Bob took care of it all. That’s Bob! A person can say they would recommend a person, but the proof is in having someone working for you year after year on multiple projects. Bob is an skilled, honest, reliable and conscientious person. I highly recommend him to anyone looking for a builder. 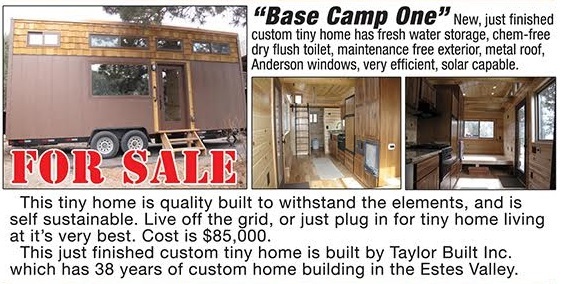 Eleven years ago my wife and I purchased a log home in Estes Park, Colorado built by Bob Taylor. Over the years our home has proven to be as well built, durable and efficient as it is beautiful. We have experienced no problems with the home’s structure, systems and appliances. Three years ago we had Bob build a separate log garage in the same style as our home and convert the original garage into an office and craft room. Bob’s dedication to quality and detail resulted in the construction of beautiful additions to our home which were completed on time and on budget. 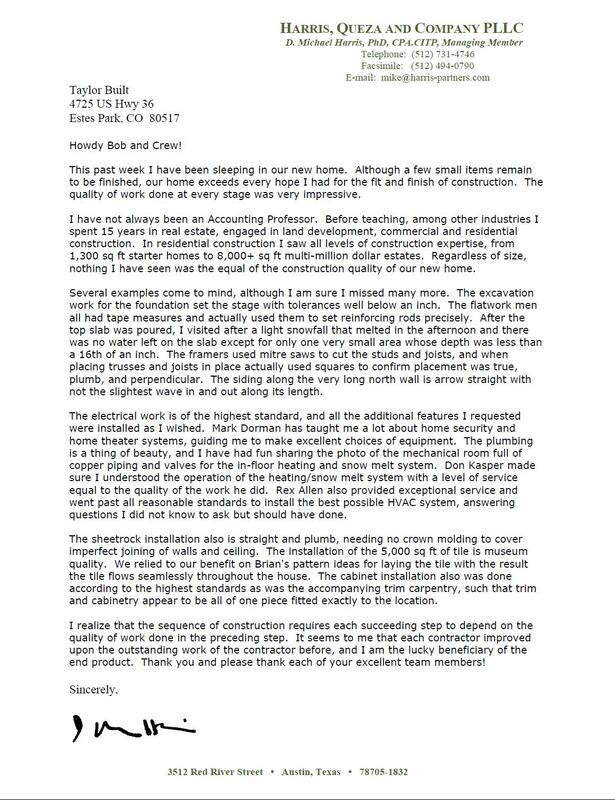 With regard to our TaylorBuilt experience, my first instinct is to say that if I didn’t love this house so much, I’d sell it in a second and start all over again because it was such a pleasure to work with Bob! When we met with him the first time, we hit it off immediately, and we instinctively knew that we could trust him- which was critical since we were living on the east coast and building in Colorado, and only made 3 trips to the house while it was being built. The quality, the craftsmanship, the attention to detail, his personality, and his ability to listen to what we wanted and his expertise in offering suggestions to improve upon our “wants “, made the entire building experience virtually “stressless” and thoroughly enjoyable and exciting. He takes each project personally and goes above and beyond to get each of those projects exactly perfect for his clients. We can’t recommend him highly enough! Our log home was constructed by Taylor Built beginning in 2005 and with move-in in late summer of 2006. Of all the decisions that were made about this build, selecting Bob Taylor was certainly the best! He and his crews were professional, competent and took the job personally. Due to site restrictions and our plans, the house is big and complicated and, given the characteristics of log homes, there have been a few issues after we moved in – most of them the result of settling – and Bob was always available to resolve them to our satisfaction.